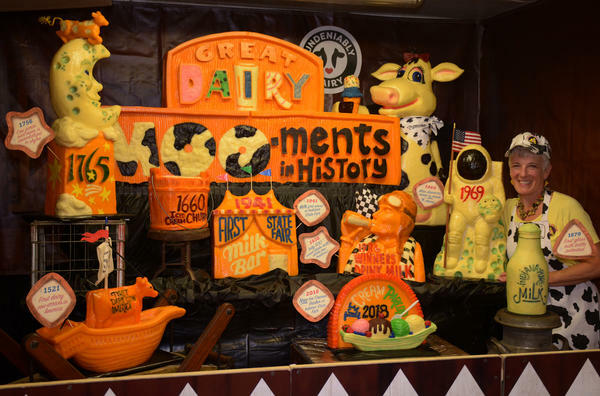 Cheese sculptor Sarah Kaufmann poses with her masterpiece, depicting "Great Dairy Moo-ments in Cheese History" on display at this year's Indiana State Fair. It weighs in at almost half a ton. Kaufmann and three assistants chiseled away for a week before unveiling their sculpture on Friday. 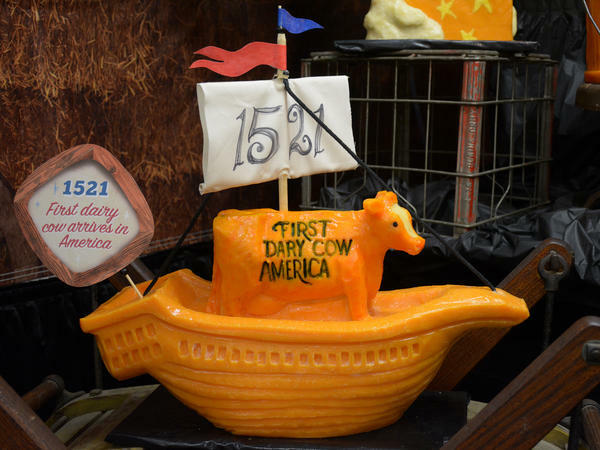 It includes a cheddar carving of the first dairy cow to arrive in the United States. A 930-pound sculpture made its debut at the Indiana State Fair on Friday. It happens to be made out of cheese — yellow and white cheddar, to be exact. The 7-foot-wide carving, called "Great Dairy Moo-ments in Cheese History," includes cheddar renditions of the first dairy cow to arrive in the United States in 1521, and the cow jumping over the moon. Sarah Kaufmann, the sculptor, has been carving cheese for more than 20 years, doing it full-time for the past 15. The Wisconsin native, whose work is an annual attraction at the fair in Indianapolis, says that cheese carving just comes naturally. As she told NPR in 2011, "The cheese found me." Indiana's American Dairy Association commissioned this year's project. Kaufmann started drafting the blueprint for her masterpiece months ago, and it'll be on display until the fair closes on August 19. Kaufmann, who previously worked as an art director in the dairy industry, gets her material directly from cheese makers in 640-pound blocks. Before the Indiana State Fair opened last weekend, Kaufmann and her three assistants used a forklift to pick up blocks of cheddar and put them on stage. Then she put chisel to cheese. She and her crew have been carving for the past week as passersby watch the carving take shape. Visitors drank milk and ate string cheese at the sculpture's debut on Friday. Most of the time, her canvas of choice is cheddar, "because it's dense and consistent, it holds up really well, it's a great price, it tastes great and it comes in big sizes," she says. Kaufmann also carves Gruyere, aged Gouda and — one of her favorites — BellaVitano, a cow cheese from a Wisconsin-based company. Kaufmann also has carved at multiple Super Bowls, and makes the rounds at other state fairs every year. She shows her work at supermarkets, trade shows, weddings and parties. "You never know where cheese takes you," she says with a laugh. "I have many cheese adventures." Today, Sarah Kaufmann's latest work of art will be unveiled at the Indiana State Fair. Who is Sarah Kaufmann, you ask? SARAH KAUFMANN: I'm the cheese lady. MARTIN: And what does the cheese lady do? She makes gigantic sculptures out of cheese, of course. KAUFMANN: Most of the time - I'd say like 95 percent - I work with cheddar. KING: Her latest sculpture at the Indiana State Fair will be made out of 960 pounds of white and yellow cheddar, and it has a theme. I'll let Kaufmann explain. KAUFMANN: It's called "Great Dairy Mooments (Ph) In Cheese History." KAUFMANN: The very first dairy cow that arrived in America arrived in 1521, so that's one image that we're carving. Another image is the cow jumps over the moon. MARTIN: So making a sculpture like this is no easy feat. Kaufmann started the planning process for this sculpture months ago, working with Indiana's American Dairy Association. She finally put chisel to cheese on the first day of the fair. She and three assistants have been carving for the past week as the fair visitors have passed by, watched and asked questions. KAUFMANN: A lot of the questions are, is that real cheese? Because nobody has seen 640-pound blocks of cheese. KING: Kaufmann says she needs a forklift just to get them in place, but it's all in a day's work for her. She's been doing this for more than 22 years, and it's taken her all over the country. KAUFMANN: I carve in supermarkets, trade shows, special events, food shows. I carve for the Super Bowl. So, you know, you never know where cheese takes you. I have many cheese adventures. MARTIN: As for this particular cheese adventure, Sarah Kaufmann's creation will be up until the fair closes on August 19. Transcript provided by NPR, Copyright NPR.